We’re wild about birds at Fifthroom.com and for those of you who agree we have lots of bird-friendly products from feeders to houses to bird baths for our fine feathered friends. 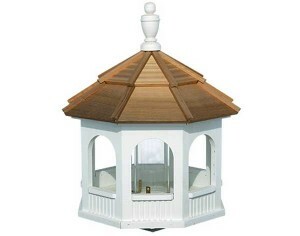 Over the past few years, gazebos have become very fashionable places to meet and greet and so it is with our amazing Mayfield Painted Gazebo Birdfeeder. Constructed from pressure-treated wood and stainless steel, it’s durable, decay-resistant and perfect for year-round use. Available in two sizes, it will be a favorite stop for birds, large and small. 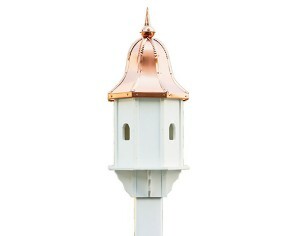 Another elegant birdfeeder is our Poly Lumber Birdfeeder with copper roof. Poly Lumber is guaranteed not to crack, chip, rot or rust and is Made in the USA. The pretty copper roof is removable to allow for easy cleaning. 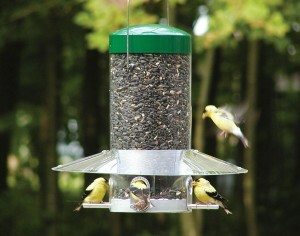 Our 12 inch Classic Hanging Birdfeeder is just that — a classic! The tube is composed of durable polycarbonate which is high impact and scratch-resistant and endures in all kinds of weather. 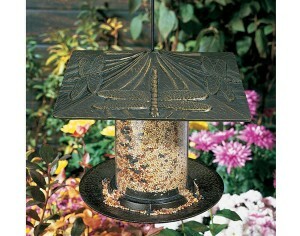 The 6 inch French Bronze Dragonfly Tube Birdfeeder is one of our most popular birdfeeders. The 6 inch poly resin composite tub holds 2 cups of bird seed and rust proof cast aluminum protects the wrap around the tray from sun and rain damage. A hanging hook is included for easy installation! Bird baths are also an important part of any bird-friendly garden and we have a variety of styles for you to choose from. This Ceramic Glazed Green Bird Bath which is made of beautiful, durable stoneware ceramic and features a lock-on top. 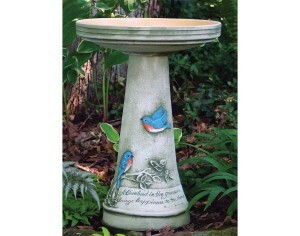 Our Ceramic Butterfly Meadow Bird Bath is a beauty and, for a limited time only, it’s also on sale! For those of you who just love elegant simplicity, our Ceramic Moss Bird Bath is sure to please. Made of quality stoneware ceramic, it is 23 inches high and is Made in the USA. Whichever bird bath suits your special style, you’ll be delighted to find out that shipping is FREE on all of our beautiful bird baths. If you’re all about birds (as we are) shop Fifthroom.com for an amazing selection of elegant feeders, houses and birth baths made with superior quality that you won’t find anywhere else!